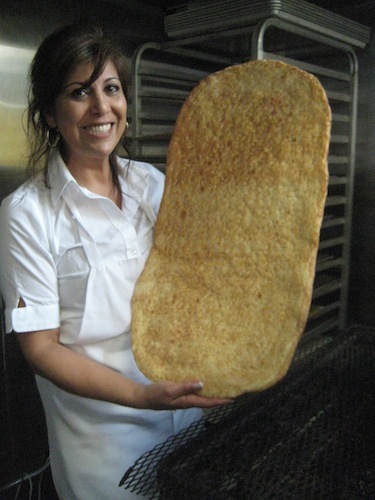 In the little shop that carries a medley of middle eastern foodstuffs on San Pablo Avenue, Jeannette Jafarzadeh hands me a piece of warm flatbread right from the oven. Her melodious voice has an indefinable accent, but warmth clearly emanates from her dark brown eyes. We have chatted before, during my trips to the Middle East Market she owns with husband Mehrdad, to pick up ingredients like rose-water or her sesame sprinkled flatbread. I know that the gracious 51-year old was born and raised in Ecuador, but I’ve always wondered how she became an expert Persian bread baker? Sharing a cup of tea at a table in the little café at the back of the store, I ask about the missing chapter in her story and unleash a torrent of memories. As we sit under celestial blue walls framed by striking scarlet drapes (she also works as an interior designer), Jeannette’s gaze is momentarily averted while she recalls the unexpected two-year detour in her life when she was detained in Iran during the Iran-Iraq war. With three brothers and a father in the military, Jeannette grew up an adventure-loving tomboy, accompanying her father, a colonel in the Ecuadorian army, wherever possible, training on the parachute tower with the soldiers. “I was so mad that they didn’t allow girls in the army,” she says, “I would have been the best officer!” Three weeks after graduating from a strict Catholic boarding school run by Italian nuns in Ecuador (“I hated sewing class,” she admits), she was off to Florida to study journalism at Miami-Dade Community College. That path changed as she socialized with students from all over the world, including a young Persian man (the cousin of her future husband). “I met new people, artists, dancers, gay friends. They asked me to model bathing suits for the fashion design department. At first, I thought, ‘no way’, but then I fell in love with fashion (and wished I had paid more attention to the nuns back in sewing class. )” While attending Florida International University for a degree in Arts, Jeannette met handsome Mehrdad Jafarzadeh, the cousin of her friend, who started pursuing her. But Jeannette put him off; she had so many other things she wanted to do first. One was to travel. When Ecuador sent her father to Germany on a diplomatic mission, Jeannette accompanied him and then decided to go on alone to Iran to visit the family of her new Persian friends. It was 1981, and 21-year old Jeannette entered the country at a turning point in the Iran-Iraq war, just before foreign airlines took out their last loads of passengers. When the dire situation became clear, Jeannette was stuck. For two years as she tried to find a way out of Iran, she witnessed the atrocities of war and bonded with the women in her future husband’s family. She remembered her father’s advice: “To blend in with a culture, is to learn the culture.” So she learned to wear the black chador and even mastered the technique of holding it in her teeth in order to use her hands while shopping (which she demonstrates to me in her café using an old white tablecloth). “After I realized I was not going to be able get out, I decided to give up on that and just get on with my life,” she recounts. The artist in her fell in love with the beauty of the land, the architecture, arches, temples, the turquoise, red and green tiles of the domed mosques in Ghom (Qom). Jeannette discovered the delights of pomegranates, the symbol of Iran. The women who took care of her (her future husband’s family) made exquisite rugs by hand. “I saw that the economy of the country came from the hands of the women.” She rebelled against the narrow roles traditionally allotted to women, taught aerobics to her new friends and flaunted custom by driving a car (covered up by her black chador, of course). Finally at age 23, her Persian friends and father engineered her escape, clinging to an airplane jump seat normally reserved for the crew in her chador, heart pounding. Even after landing in the Frankfurt airport, it was hard to shake the feeling of being watched. Finally, in an act of courage, Jeannette tore off her chador and threw it in the trash. When she returned to her native Ecuador, she set up a center to train and empower women (including disabled women) through classes in aerobics, dance, modeling, make-up and photography, and achieved much success and renown staging events at cultural festivals. One day, her long-time friend Mehrdad showed up. After pursuing the beautiful and independent Jeannette for 11 years, he again proposed. She finally accepted. They moved to California, where Mehrdad had been living. He owned and ran several successful restaurants in San Francisco and Sausalito that served California cuisine. 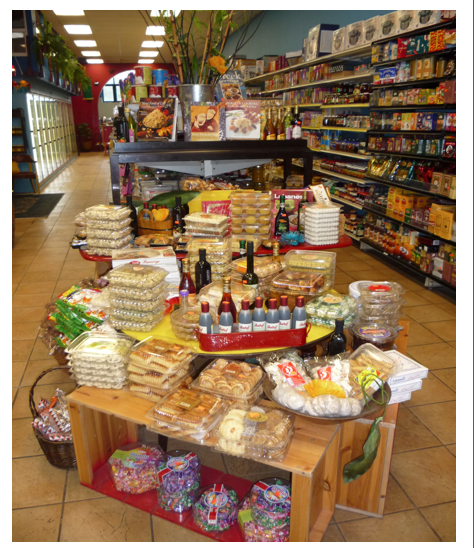 In 2010, Jeannette convinced him to connect to his Persian roots and they opened the simply named Middle East Market, where they stock staples from many Mediterranean cuisines. 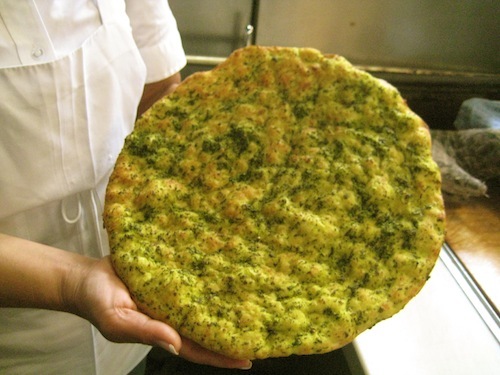 We walk back to the kitchen now and Jeannette offers me a piece of her “green bread,” a Persian inspired specialty that Jeannette says is her “multi-cultural creation”: a disk sprinkled with an aromatic paste of scallions, basil, feta, olive oil and cilantro (the South American element). It smells divine, tastes homey and melts in my mouth. When the store first opened last year, Jeannette came in early four mornings a week to bake all the fresh breads herself. But she recently hired bakers, who happen to be from Central America, to take over the early shift. Since she cooks mostly Persian foods for her husband, during the training period, she took advantage of the opportunity to make the workers her favorite Ecuadorian breakfast, majado, with onions, eggs and platanos or yucca. And now she has the time to pursue her new interest (taking computer classes) with the same passion she has demonstrated throughout her life. 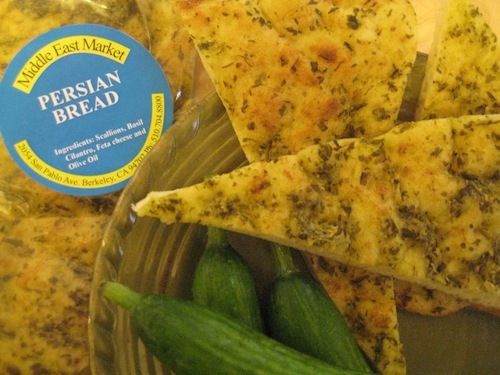 This entry was posted in Immigrants' stories, Middle Eastern Food, Persian/Iranian and tagged afghan bread, Berkeley, flatbread, Middle East Market, San Pablo Avenue. Bookmark the permalink. Thank you so much for enriching our lives! Thank you, Dan, for reading. I feel privileged when people share their remarkable stories with me. Probably everyone has a remarkable story inside, if you just know the right question. Anna, I find you everywhere! And your writing is wonderful, no matter the topic.